1. Listening - I've always believed that the key to successful consulting and software development is listening to people and writing things down. My most important tools are my notebook, a pen and a pair of ears. 2. Self-Confidence - This comes from the specialized knowledge systems that I have built through my years of experience. In my areas of expertise, I can tell almost immediately whether I can help you, and if so, how. 3. Pragmatic Perfection - I have an endless capacity for improving any system, always balanced by the ruthless application of the criterion "Does it work?". 4. System Builder - I combine imagination and reliability to be able to both envision a system and to convert the vision into a working reality. 5. Vision - Others may see what is and wonder why; I see what might be and say "Why not?". I enjoy developing unique solutions to complex problems. 2. Windows Applications - I've created a number of custom Windows applications that are easy to use while being robust network applications. 3. End-User Software - I have developed applications that are in use by hundreds and even thousands of users. Issues of installing updates, backing up/restoring data, on-line help, etc. are all dealt with professionally. 4. Complex Programs - Experienced with systems such as one for State Housing Agencies to calculate and track the monthly subsidy payments for over 66,000 tenants. 5. Presenter/Speaker - Frequent presenter and speaker at local computer and business group meetings. 6. Training - Conducted On-Site Training for Carpet Co-op of America in Manchester, NH, and for Anheuser-Busch in St. Louis, Arnold, and Dallas. 7. Application Development - Since 1987, I have developed over 100 applications, covering a wide range of applications, from simple to complex. I am extremely good at requirements analysis and application design. 8. Low-Level Software Development - I developed many applications that required low-level programming: Serial Communications, Mainframe Communication and File Conversion. 9. Electrical Engineering Degree - I developed test software for the F/A-18 aircraft for McDonnell Douglas for six years. 2. Olympic Weightlifting - As a competitor and coach. 3. 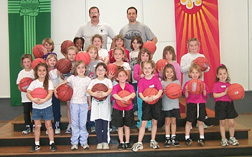 Coaching Youth Basketball and Soccer.